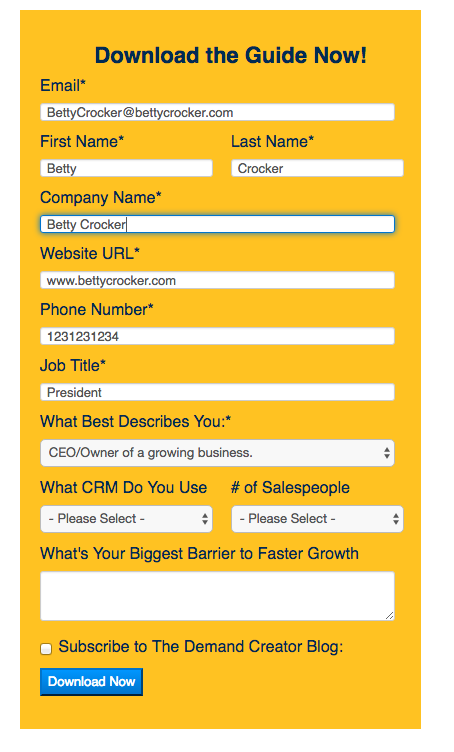 When I first learned about marketing automation software, I was instantly a fan…a huge fan. It was like my marketing dreams were finally coming true. I was like a little kid in a candy store thinking about everything I could FINALLY do in an effective and efficient way. When the company I was with decided to make the investment in marketing automation, I was super excited. I couldn’t wait to get started. And then…I had a moment of panic. Actually, it was more than one moment. While I was truly excited about the capabilities the new software had, I was suddenly overwhelmed by it. 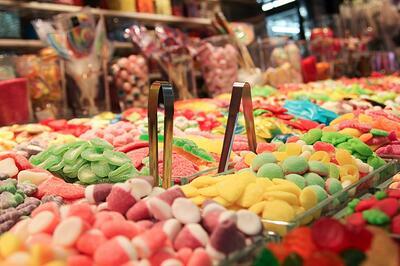 I was sort of feeling like the little kid at the candy store who ate too much candy. Expectations were high. The monthly license fee was a significant part of our marketing budget. It would be important that we were able to make the most of our investment. Everyone was going to be watching. Utilizing the software to its fullest potential and demonstrating that with impactful results was priority number one. Sound familiar? I’m sure many of you reading this have found yourselves in a similar situation. Or maybe you’re in a situation now where you have been using your marketing automation software for quite a while but feel like it is under utilized…like it and you can do more. When an organization decides to make the investment in marketing automation, it is vitally important that they get the most bang for their buck. Here are six tips to help you do just that. I know. It seems really obvious and you’re probably thinking that I think you’re really stupid. Trust me. This is something that gets overlooked more often than you’d think. Let’s face it. Marketing people are not IT people even though the need for us to be IT-savvy is increasing literally every day. (More on that in a future blog post.) I was lucky. When the company I worked for implemented marketing automation, we worked with a consultant who made sure all of the basics were covered. Many marketing managers do not have that luxury. Their company makes the decision to move forward with marketing automation and its up to them to figure it out. If the tracking code is not embedded correctly and on the right pages, the impact the marketing automation software can have is greatly diminished. Before you blow this tip off, just make sure it has been done correctly especially if you’re not working with a consultant or an agency. If you’re not sure how to do it, contact the software provider. If they’re worth what you’re paying them, they’ll help you through that process. Note – if you’re a HubSpot user like we are and your entire website is hosted by HubSpot, there’s no need to install a tracking code. However if you’re using HubSpot but your website is hosted by another provider or not all pages are in HubSpot, you will need to embed the tracking code on those pages. As you know, at Imagine, we use HubSpot. We also use HubSpot’s CRM. Integration between the two is obviously easy because they were built to work together. The data that is shared between the two is critical to our success. The entire demand generation team – marketing, sales development and sales – can see every action that has been taken by us and by each prospect. We know which emails were opened and which links were clicked. We know the web pages visited. We know every call made – and we can listen to it. Not only does this information help guide our actions on a prospect-by-prospect basis but it helps us develop a better picture of the buyer’s journey for each of our personas. It helps us develop relevant content and call scripts. 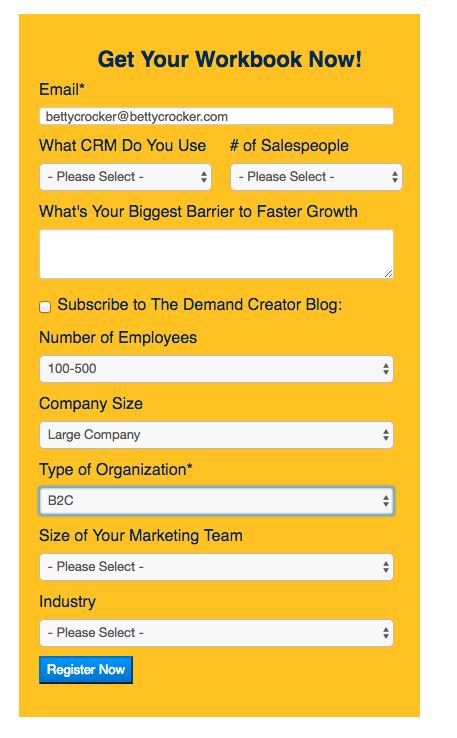 If you’re not using HubSpot, integration with your CRM may take a few more steps but is definitely possible. Contact your providers and they can help you get started. If you haven’t integrated the two, you’re definitely not getting the most out of your investments. One of the coolest things about marketing automation software is that it allows unknown visitors to your website to become known visitors. If you know your personas, have created great offers, have designed action-oriented CTAs and landing pages, visitors will reveal their identities to you by filling out your forms. Sure, it’s great to get someone’s name, company name and email address but there’s so much more marketers can learn by asking for more information. That’s where progressive profiling comes in. 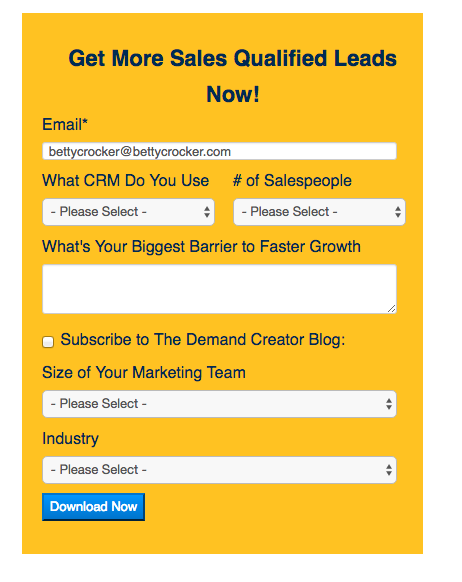 The marketing automation software, in this case HubSpot, recognizes that Betty has already filled out a form and asks new questions each time she downloads an offer allowing us to learn more each time. This is another way that marketing automation can help you learn more about your personas, their buyer’s journey and what’s important to them which allows marketing to create relevant content that keeps them coming back for more. Another thing that I Ioved from the beginning about marketing automation is the ability to create lead nurturing workflows. How cool is it to be able to design specific messaging to a highly segmented group of contacts that is controlled by their actions? I think it is really cool. While the capability is awesome, creating the messaging that will get your prospects’ attention and action is hard work. Sometimes it seems too hard so this part of your software just sits there…not being used. This tool is too powerful to just sit there. Prioritize creating lead nurturing programs. Start small with just one of your personas and build from there. The more you learn about your prospects by how they respond, the better the adjustments you can make as you move forward. If you don’t know where to begin, start with our guide to lead nurturing. Then figure out how to build the actual workflows in your software…that’s really the easiest part. We love data at Imagine. We talk a lot about metrics in this blog. Another part of marketing automation that is often under utilized is the reporting function. Most systems allow you to run reports on all sorts of things…page performance, visits, actions of prospects…the list goes on and on. If your tool requires you to, create the queries or reports that will show you on a regular basis how leads are progressing from one stage to the next. Identify any patterns. If all of your leads are stuck as just leads, adjust the content you’re offering or add a sales development function to move them forward. The point is your marketing automation software has the ability to help point you in the right direction. It’s up to you to let it. If you’re a HubSpot user, this is an easy one. HubSpot has already done it for you. All you need to do is link the right social media accounts and you can schedule everything using one tool. Many other marketing automation tools offer this capability or the ability to integrate. By integrating your social media efforts into your marketing automation platform, you are opening another window to yet more information about your buyer personas. It is easy to promote blog posts and landing pages and analyze engagement. This will again provide insights into how the content you’re creating is resonating with your audience providing another opportunity to adjust and improve your results. Marketing automation really is a great tool for marketers and can be an important part of your demand generation strategy. The key to getting the most bang for your buck is to learn how to use it to meet your overall business objectives. Spend the time to figure out everything from the basics to the most advanced features and you’ll never feel like you’ve eaten too much candy.